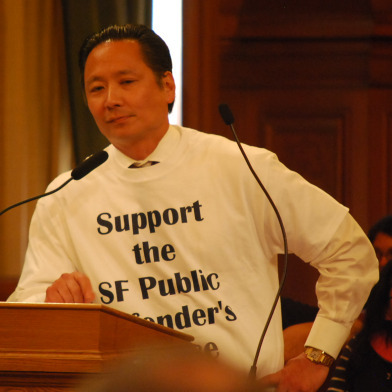 6:18 PM: Public Defender Jeff Adachi highlighted “fiscal responsibility” as he filed his mayoral nomination papers just before the late afternoon deadline at City Hall today. Adachi took his oath at 4:25 p.m., just before the 5 p.m. deadline at the Department of Elections in City Hall, only hours after filing his decision of intent papers. San Francisco has seen public summer school cut for the first time, Adachi said. The other fiscal problems Adachi addressed include a $4.3 billion non-funded health care liability, overtime problems, an inability to fix city streets. “Taking on an issue like pension reform is difficult, but it has to be done,” Adachi said. In addition to the mayoral race, Adachi will be running the campaign for pension reform, one he has championed and that has seen vocal opposition. “This is not a race about one particular philosophy about how this city should be run,” Adachi said. “(The voters) want a mayor who understands what needs to be done and is not afraid to take the actions that come with that. “We don’t suffer from lack of ideas in San Francisco; it’s lack of action,” he said. Adachi says he will focus on public works, mental health, and homelessness in addition to pension reform. Adachi, who originally had no plans to run for mayor, felt “compelled” to enter the race, coming to that decision in the past few days after listening to some of the debates and not hearing what he believed was best for the city. This comes only days after Mayor Ed Lee also entered the mayoral race after initially stating he would not run. Adachi becomes the 15th candidate to file for the mayoral race, and he will not apply for public campaign financing. 12:16 PM:San Francisco Public Defender Jeff Adachi pulled papers this morning to run for mayor in November, according to the city’s Department of Elections. If Adachi files the papers–the deadline to do so is 5 p.m. today–he would join an already crowded field of candidates that was joined earlier this week by interim Mayor Ed Lee. Adachi, who was not immediately available for comment this morning, is backing a pension reform ballot measure for November that is competing with another pension reform measure put on the ballot by Lee and other city officials.